Wow. This sold for $10,455! (before commission). And I was thinking their estimate was on the high side. Vernon's silhouettes usually sell for around $200 to $500 on auction sites, depending on who he cut. The subject matter made a whopping difference this time around. HH is still red hot these days. We still can't be sure if Vernon cut this while HH was posing. He could have done it off a profile photograph. 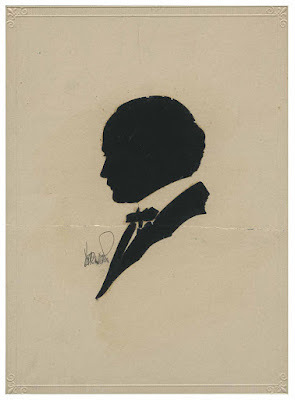 Vernon's silhouette of Hereward Carrington, signed by Carrington, took $399.75 (estimate was $600-900).